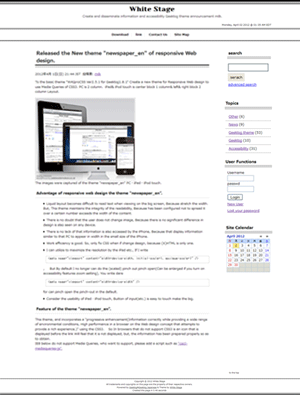 Advantage of responsive web design the theme "newspaper_en". Liquid layout becomes difficult to read text when viewing on the big screen, Because stretch the width. But, This theme maintains the integrity of the readability, Because has been configured not to spread it over a certain number exceeds the width of the content. There is no doubt that the user does not change image, Because there is no significant difference in design is also seen on any device. There is no lack of that information is also accessed by the iPhone, Because that display information similar to that PC to appear in width in the small size of the iPhone. Work efficiency is good. So, only fix CSS when if change design, because (X)HTML is only one. for can pinch open the pinch-out in the default. Consider the usability of iPad ・ iPod touch, Button of input(etc.) is easy to touch make the big. Feature of the theme "newspaper_en". This theme, and incorporates a "progressive enhancement(Information correctly while providing a wide range of environmental conditions, High performance in a browser on the Web design concept that attempts to provide a rich experience.)" using the CSS3. So In browsers that do not support CSS3 is an icon that is displayed before the link Will feel that it is not displayed, but, the information has been prepared properly so as to obtain. The images were captured of the theme "newspaper_en" by the Internet Explorer7. This site is Geeklog1.7.1. But, I put a theme on this site, newspaper_en of the specification 1.7.1for you see design of the theme "newspaper_en". You can view my theme and choose "newspaper_en" in the trial of the theme, please refer to. For files that were modified and added when you create a theme "newspaper_en". Modified files when I create a new theme of "WAIproCSS Ver2.5.1 for Geeklog1.8.1" is equal to 7 the following file. What to do when the theme "WAIproCSS" has been upgraded. Based on the "WAIprCSS" was up version, files other than custom.css is compare the files of the theme "newspaper_en" and the version-up file, please correct where necessary. Save custom.css is, please add an additional file above. If the above does not include the file (file modified) Changes to the "WAIprCSS" the version up, Please save the file, fix the "WAIprCSS" theme was upgraded to "newspaper_en". If there is a place that is specified in the value of px (width) of the large width of the site that will be used in this theme, It is very likely that causes the breakdown of layout, please change it to auto or%. If you do not want to set the style to "last" or "first" pagination, 、Since we set the style to turn off the same design as the numeric portion custom.css, lines, etc. will disappear surround the "last" or "first" and asked to fix as follows: lib-common.php. I has issued a request to Geeklog Bugtracker mark-up and I want you to fix as described below. License of the theme "newspaper_en", the new license in accordance with the WAIproCSS.WAIproCSS license will be as follows. For information about downloading the theme "newspaper_en"
Download the theme "newspaper_en", go from the download section White Stage or Geeklog.